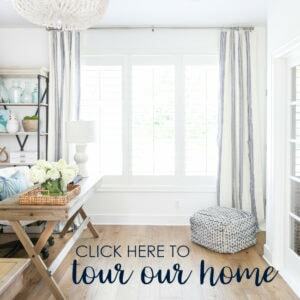 It’s one of my favorite blogging days of the entire year – summer home tour day! 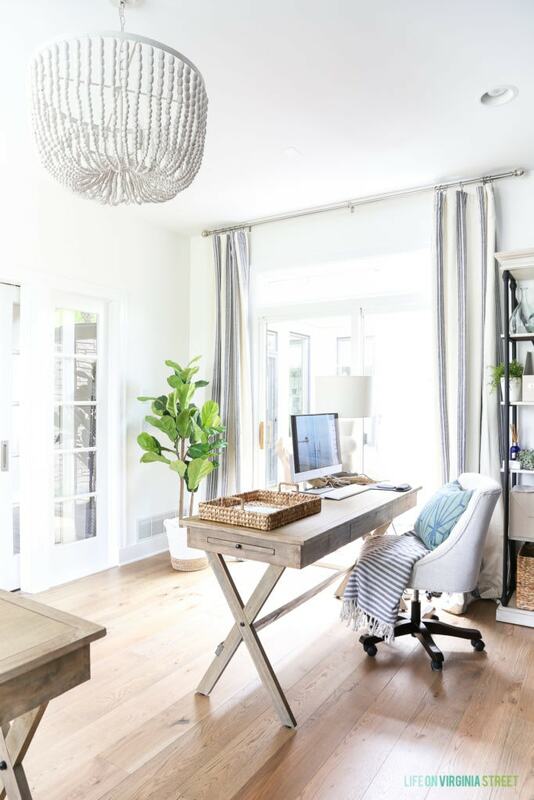 Today I’m joining Marty from A Stroll Thru Life, along with 30 other bloggers, to share my summer home tour! If you’re stopping in from Simple Stylings, welcome! I love Summer and her gorgeous style! In past tours, I’ve split our home up over a few tours, but today, I’m actually going to be sharing all of the spaces with updates all in one post! If you’ve read here for awhile, you know I’m a summer girl at heart and couldn’t be happier warmer weather is here to stay for a few months! Let’s jump right into the tour! After each room, I have a widget with all sources so you can simply click any of those images to learn sources for each item shown. Over the past year or so, I’ve made a number of updates to our entryway. Most involved paint but I’m loving the updated look! Now I just need to update the paint in the stairwell, on the banisters and on our office doors. Something I haven’t shared yet, I just updated our entryway hallway console table! The table is knock-off of a designer version I’ve wanted for ages, but I just couldn’t justify the cost of the original. The art is from HomeGoods earlier this year and I’m loving this new block print pillow here! 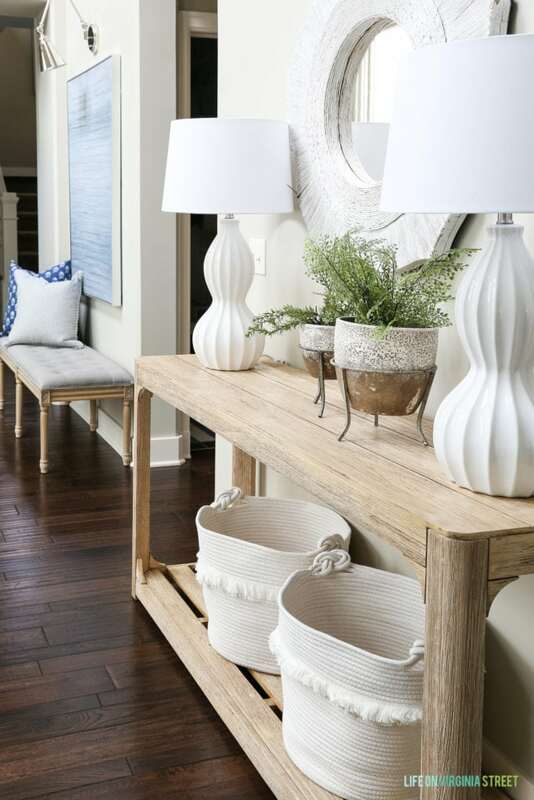 The tone on the new console table works so much better in our space, and I love how it lightens up this area! Up close, it’s clear it isn’t truly a natural wood, but I’m totally okay with that since it’s about $1200 less than the one I actually wanted. I love the new look it provides! And how cute are these rope baskets?! I only made a few minor updates in our living room for summer, with the switch of some pillows, greenery and art. After my gallery wall frames sat empty for a few months, I figured it was time to fill them in time for the tour. I still hadn’t settled on art or photos to use, so I simply filled the frames with ombre colored cardstock I had on hand. So basically it was free art. Score! I’m loving these indoor/outdoor shibori-like pillows for the summer months. Since we tend to have a lot of visitors all summer with the pool, it’s nice to have durable pillows I don’t have to fret over! I haven’t shown our office, basically since the reveal last year. But that’s mostly because nothing has really changed – we love it as is! I love how bright and sunny it gets in the summer months. The view has changed quite a bit now too, with the house being white. It totally changes the vibe now and I love it! 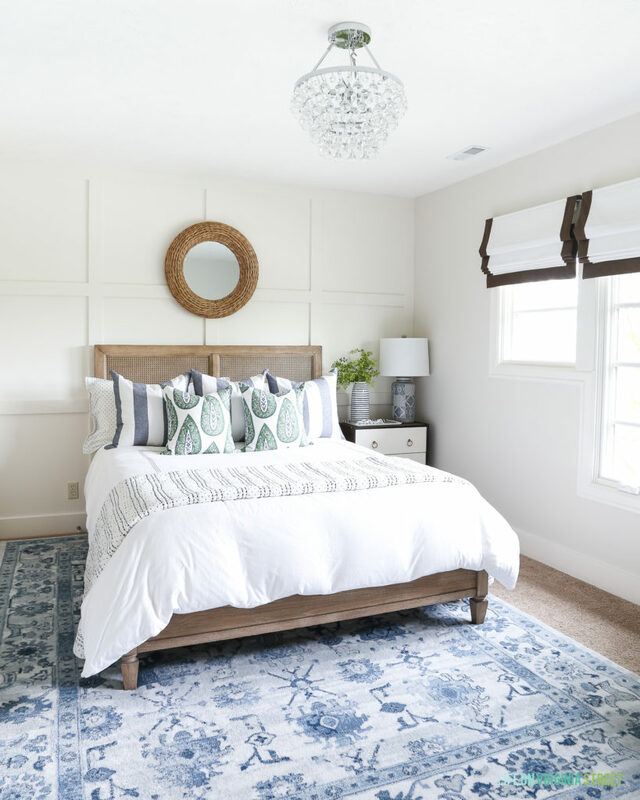 A month or so ago, I gave our smaller guest bedroom a mini-refresh and I love the new look! Clearly I haven’t centered the rug yet after I realized in photos we were off center by like a foot! 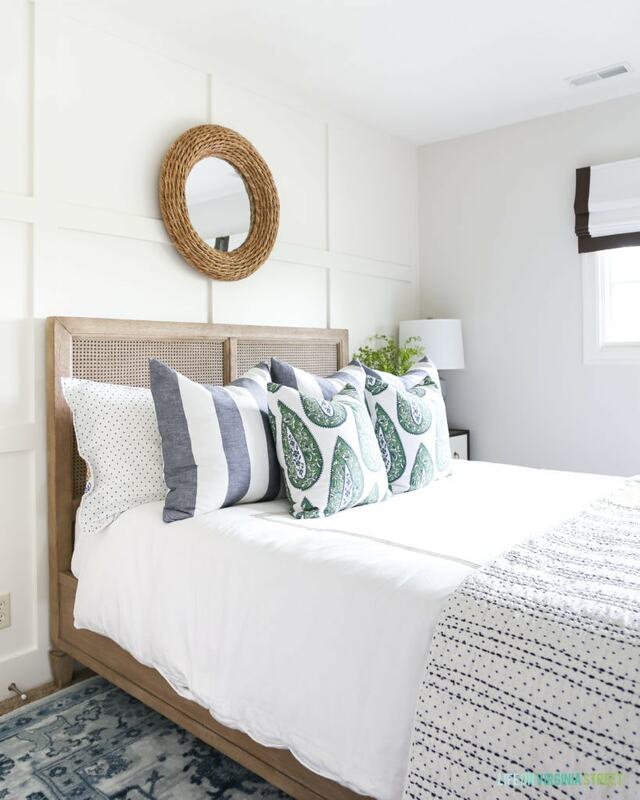 We already have several sets of guests scheduled to use this room this summer (it’s usually the overflow when we have guests in the other bedroom), so I’m glad I got it looking just how I had envisioned for the summer months! I also did a few fun updates in our craft room/TV room recently too. We actually have a few times this summer where our house will be so full we’ll have a guest sleeping in here too! Thankfully the room is now ready for more guests! We had our house painted white a few weeks ago (it used to be a fairly dark brown), and we couldn’t be happier with the result! I plan to share the before and after tour on Thursday including what we did on the front of the house, so be sure to check back for that! We’ve had countless meals out on our covered patio this summer already and we can’t get enough of it! Up until all of our recent updates, I can count on one hand the meals we had eaten out here previously. So, it is fun change to our routine to eat breakfast and dinner out here each day! I hope you enjoyed our summer home tour! 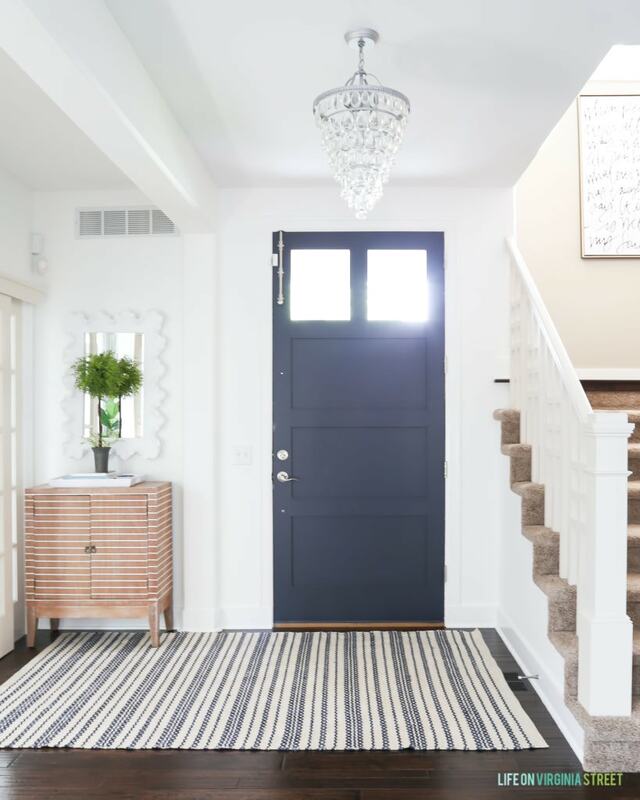 The next stop on the tour is Remodelando La Casa – I know you’ll love Cristina’s style! 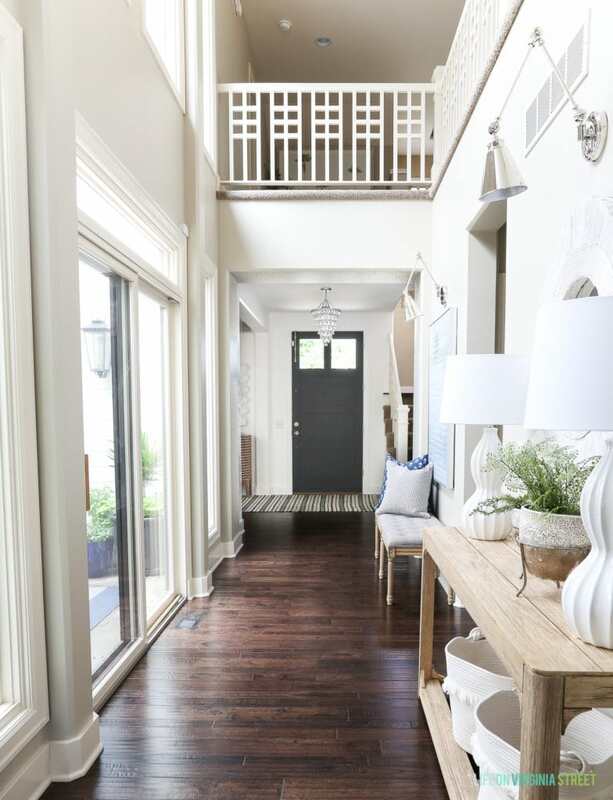 Once you’ve stopped there, be sure to stop by all the other homes on the tour, as well, for loads of summer inspiration! Your house is so gorgeous! Love the new house color so much and your pool area is like a resort. Super pretty! Your home and yard look so beautiful!! I love all the updates and changes that you’ve made. And painting the house white…GORGEOUS!!!. I know y’all will have a fun summer in that pool!! 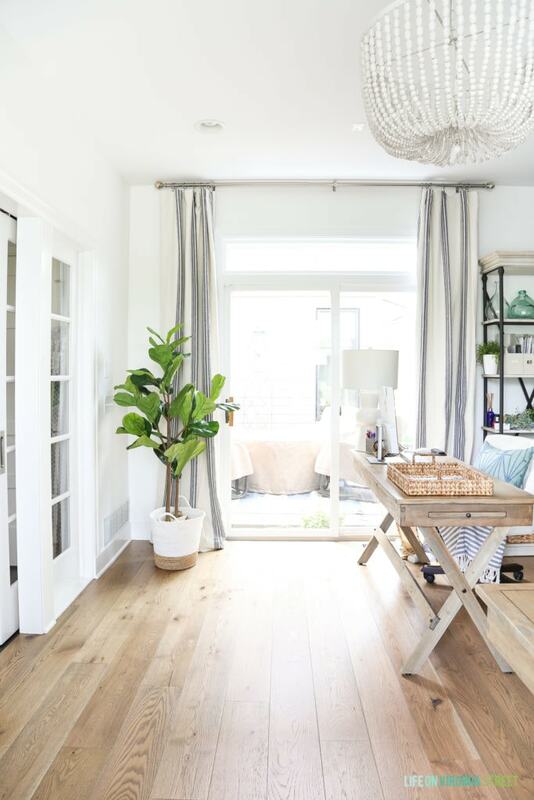 I’ve always loved your home tours a lot, but I think this one is my favorite! White and blue couldn’t look any better. Love it all! It is actually carpet inset into our hardwood. Unfortunately I don’t have any info on it as it was here when we moved in. Sorry! You mind sharing where you purchased your planters that are on your hallway console? Love the white color on the house and you know I think your pool is FABULOUS. You have done such an amazing job with your decor indoors too. 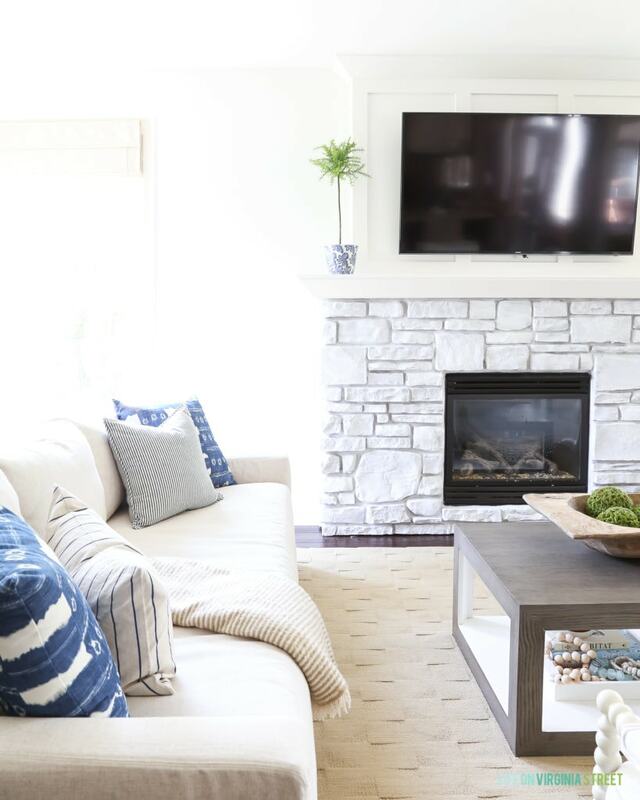 I love, love, love the neutral tones and light accent furniture pieces you are using, so pretty. I especially love that daybed in your craft/tv room. Styling it with hats is perfect. Thanks so much for joining the tours, Love your style. 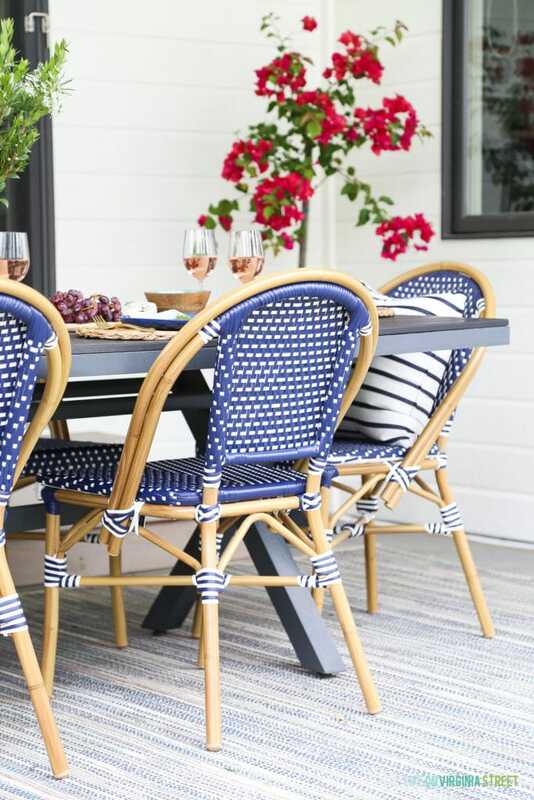 Your patio is amazing! 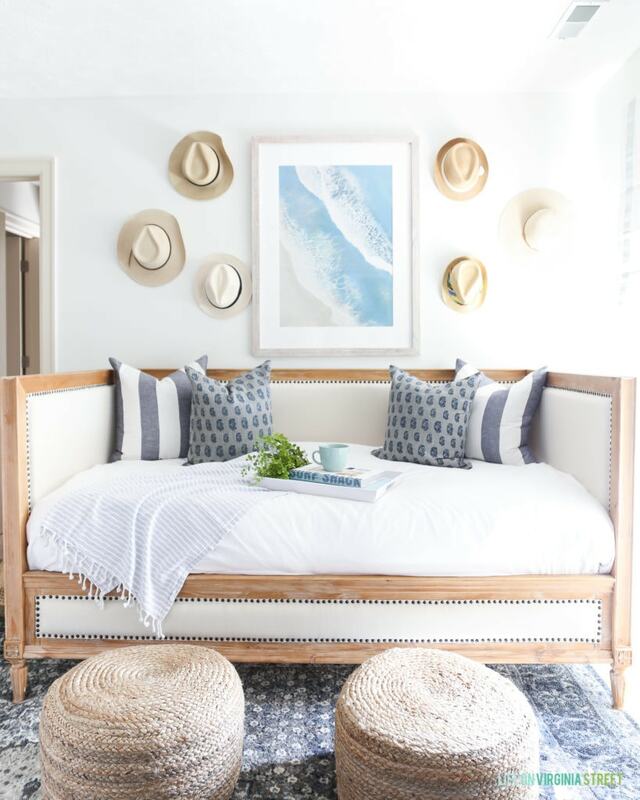 I adore the daybed and the pops of blue. 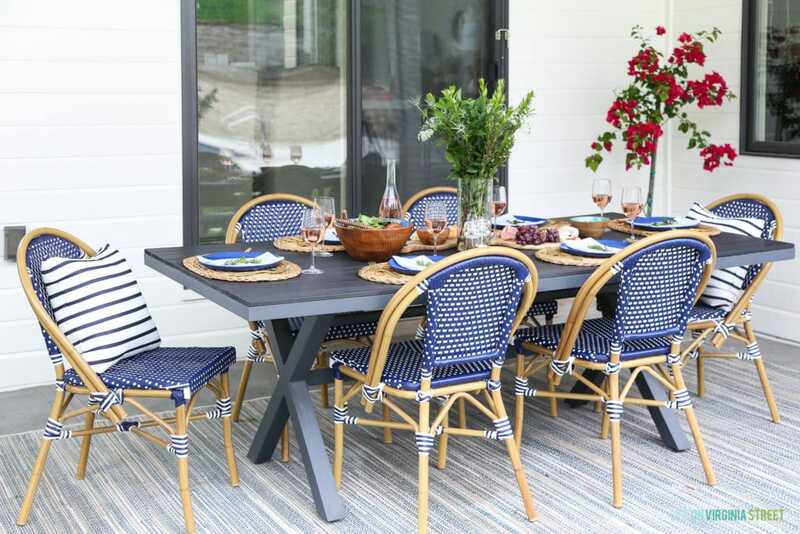 If someone asked me to pick one home that is the epitome of summer, it would be yours! Everything is gorgeous and summertime fresh! It all looks gorgeous Sarah! 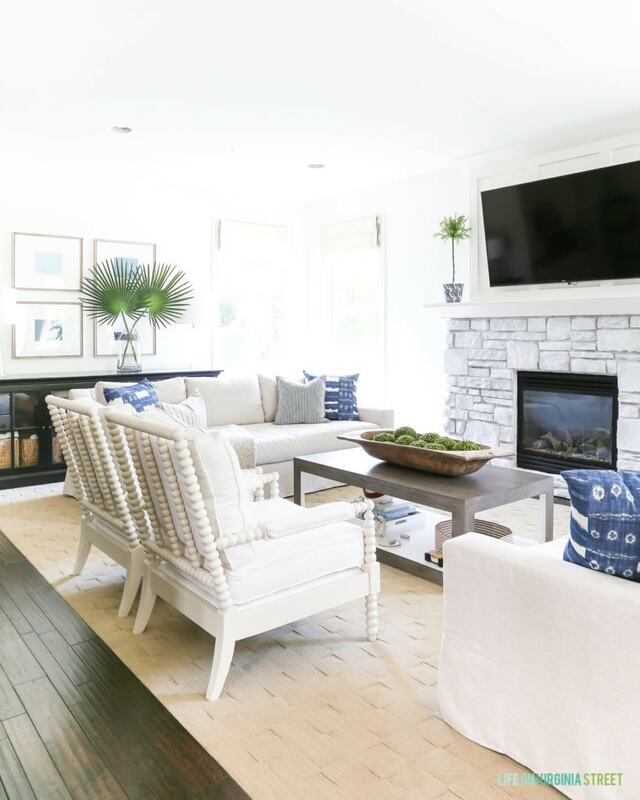 I love how much white you’ve incorporated into your house this year, and the new white exterior looks amazing! You style everything so beautifully! As always, your house is just so beautiful! The white on your exterior!!! Ahh! It looks amazing!! 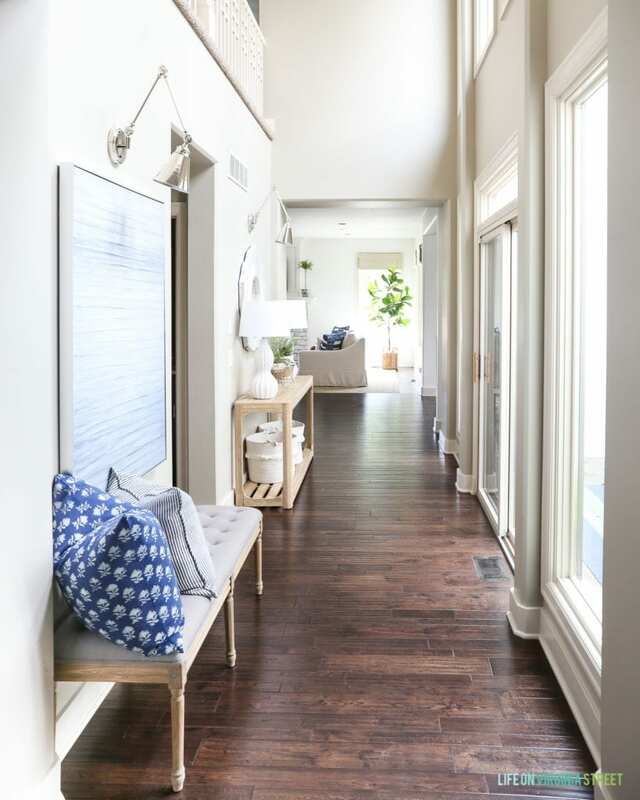 as always you home is so beautifully styled. Classic, fresh and perfect for summer. You and curtis must sit out by the pool and just stare at the exterior and smile! The crispy white goes well with the blue accessories. Love your home 🙂 Couldn’t make any better than this one! I bet you love the exterior paint. It looks amazing. I can’t wait for the rest of the reveal. It’s all so fresh for summer. Hey, Sarah, your home looks so good! You’ve really done a great job with everything, love the summer blues you have going and that pool! Gah! I’d be out there all the time. How do you get anything done? 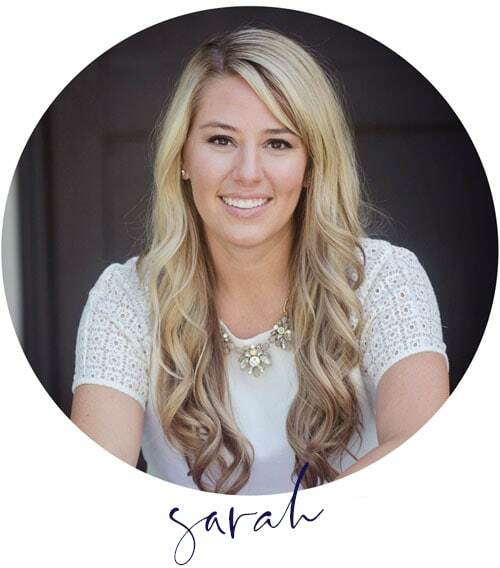 Sarah, your home is styled to perfection! Your home is just gorgeous! I love your style and everything looks perfect! It really makes me jelaous! 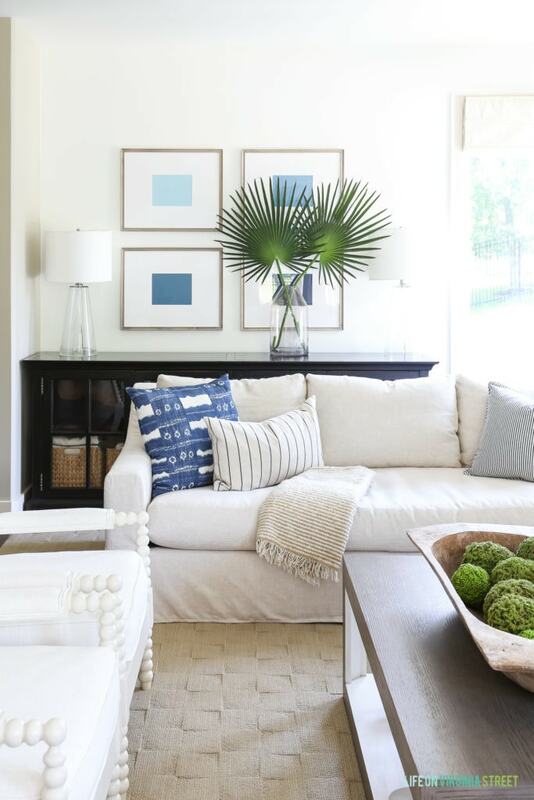 I love all of the blue accents in your home, especially paired with the greenery from your houseplants. Absolutely gorgeous! Beautiful tour! I love your free art gallery wall! 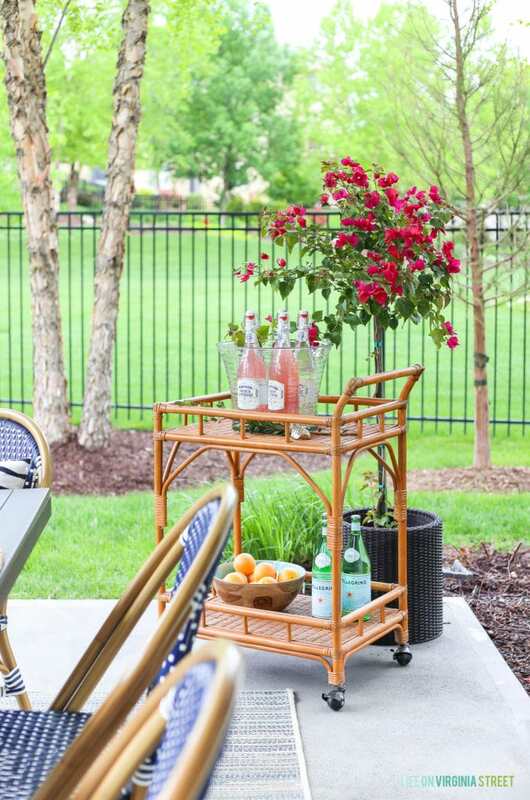 Your outdoor space is amazing too. Pinning away! Nice to meet you through the tour! I wanted to pick my favorite part, but it is ALL perfect! Just so beautiful. Your home is just delightful! You did amazing job, I like how bright and stylish everything is.